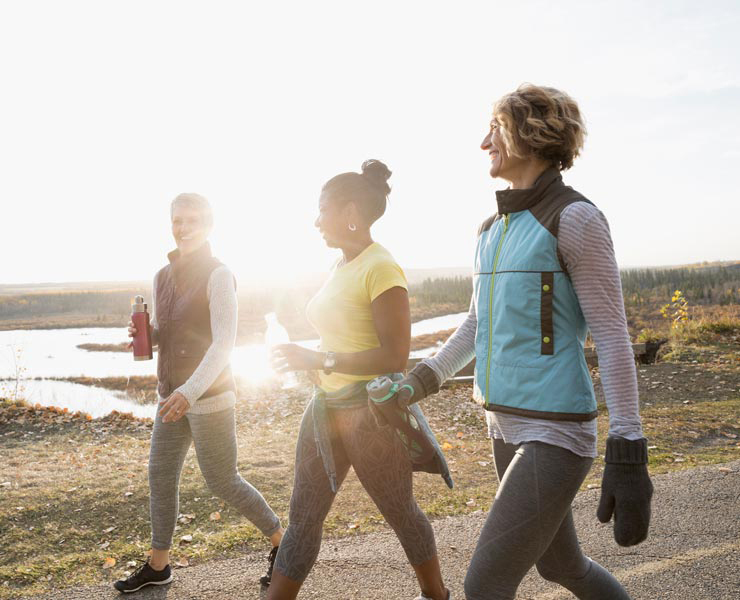 Any style of walking that gets you moving is good at first but, eventually, you’ll have to pick up the pace, get your heart rate up and break a sweat if you want to get the calorie-burning, muscle-toning and health-boosting benefits. “We’re not talking a major overhaul, just a few strategic tweaks to your walking posture and technique, so it’s easier for you to go farther and walk faster,” explains Lauren Jawno, certified high-performance coach, speaker and author. 1. Take smaller, quicker steps. Speed up by taking smaller, more frequent steps. You don’t have to sprint but you do need to step with purpose during your walk. Pretend you’re running late. Walk like you’re on a mission. If you’re walking at the proper pace, you should find talking difficult but not impossible. 2. Use a heart rate monitor. You should be walking at a brisk enough pace to maintain your heart rate in your target-training range. This ensures you’re working hard enough to benefit your heart but not so hard that you risk injury. The easiest way to track your hart rate is with a heart rate monitor. Choose between the classic chest strap, which uses an electrical pulse to read heart rate, or other wrist-based activity trackers like Fitbit. 3. Move your arms. You can really rev up your walking intensity by moving your arms. Bend your arms and naturally swing them forward and back. Avoid a side-to-side motion across your body. Keep your hands loose and relaxed. Don’t clench your fists. 4. Stand up straight. Stand tall and avoid leaning forward. Leaning puts a strain on the back muscles as you walk and should be avoided except when on a hill. Imagine there’s a string attached to the top of your head gently puling you up and lengthening your spine. 5. Keep your head up, chin parallel to the ground. Keep your gaze focused 15 to 20 feet directly ahead, not down at your feet, which takes your spine out of alignment and puts extra stress on your neck. 6. Shoulders down. Relax your shoulders, rolling them back and down, not scrunched up by your ears. Every 10 minutes check to make sure they’re down and relaxed. Relaxing the shoulders helps relieve tension and put them into a position to use good arm motion while walking. 7. Engage your abdominals. Tighten stomach muscles, pulling your belly button toward your spine. Your core muscles can help you maintain good posture and resist slouching and leaning. 8. Roll with it. You shouldn’t be walking like the Tin Man with rigid knees. Your steps should have a rolling motion, moving from heel to toe. With each step, land on your heels and push off with your toes, keeping knees slightly bent. 9. Walk outside. Walking on grass or earth with its natural variations also gives your legs more of a workout than pavements and subtly challenges your balance, which tends to deteriorate with age. These simple adjustments will make a big difference to your fitness walking. Try to go faster and farther, and add a few hills to your walk. Always stretch your muscles before, during and after walking to avoid cramps and strains. And as always, check with your doctor before starting this or any fitness program.